Guitarras con Sabor, Gypsy Kings-style rhythms, 8 p.m., no cover. Limelight karaoke, 10 p.m., no cover. Karaoke night with Michelle, 10 p.m.-1 a.m., no cover. Country singer Wiley Jim, 7 p.m., call for cover. Electric jam session, 8:30-11:30 p.m., no cover. Pianist David Geist, 6:30-9:30 p.m., call for cover. 16TH ANNUAL RÍO COSTILLA STUDIO TOUR From 10 a.m. to 5 p.m. Saturday and Sunday, Sept. 6-7, the village of Costilla (in the San Luis Valley bordering Colorado) invites visitors to view local artists‘ works including photography, paintings, furniture, and sculpture during this self-guided tour. Costilla is located north of Taos on NM 522. Visit riocostillaart.com for a map and list of artists. Shown, Castaway, by Rene' Janiece. Teatro Paraguas, 3205 Calle Marie DNAWORKS and Teatro Paraguas present a play by Irma Mayorga, 7 p.m., $15, discounts available, 505-424-1601, Thursdays-Sundays, through Sept. 14. National Theatre of London in HD Three Paths to Publishing: Which Is Best for You? Unitarian Universalist Church of Santa Fe, 107 W. Barcelona St. A New Mexico Book Association fall workshop series titled Get Published!, led by Susan Guyette, 6:30-8 p.m., $20 at the door, register by email to admin@nmbook.org, 505-660-6357. Argentine Tango Milonga, 7:30-11 p.m., call for cover. Singer/songwriter duo Bittersweet Highway, 8 p.m., no cover. James A. Little Theater, New Mexico School for the Deaf, 1060 Cerrillos Rd. The free series continues with Seeing the Future in Our Past: Why Archaeology Matters, by SFI president Jeremy Sabloff, 7:30 p.m., santafe.edu. Singer/songwriter Jesús Bas, 7-9 p.m., no cover. The Littlest Birds, old-time music, 8 p.m., no cover. Midweek rock with the John Kurzweg Band, 8 p.m., no cover. The Lensic The broadcast series continues with Medea, 7 p.m., $22, 505-988-1234, ticketssantafe.org. St. John‘s United Methodist Church, 1200 Old Pecos Trail Michael Nutkiewicz discusses Spinoza, 1-3 p.m., $10, 505-982-9274, renesan.org. Songs from the Great American Songbook, with guitarist Jim Almand, 7-9 p.m., no cover. Chanteuse Nacha Mendez, 7-9 p.m., no cover. Kari Simmons and Todd Lowry, vocals and piano, 6-9 p.m., call for cover. Juke-joint, honky-tonk, biker-bar band Broomdust Caravan, 6-9 p.m., no cover. Los Esmitz, featuring Nacha Mendez, Mustafa Stefan Dill, Ross Hamlin, D. Santi, and Alex Pigeon, 7-10 p.m., no cover. 21120 U.S. 84, 505-685-4378 Abiquiú Studio Tour preview exhibit, reception 4-6 p.m. Sunday, Sept. 7, through Oct. 30. 524 Haines Ave. 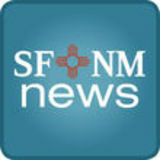 N.E., 505-228-3749 At First Sight, mixed media by UNM MFA students, through Sept. 12. The Kosmos, 1715 Fifth St. N.W. Music of Shostakovich and Kurt Atterberg, 10:30 a.m. Sunday, Sept. 7, poetry reading by Tony Mares follows, $15 at the door only, discounts available, chatterabq.org. Costilla, north of Taos on NM 522 A self-guided tour running 10 a.m. to 5 p.m. Saturday and Sunday, Sept. 6-7, view works including photography, paintings, jewelry, furniture, and sculpture, map and list of artists available online at riocostillaart.com. John Kurzweg Band, rock, 8 p.m., no cover. Canyon Road Blues Jam, 8:30 p.m., call for cover. Open-song night with Ben Wright, 7 p.m., no cover. Singer/songwriters open mic, 7-11 p.m., no cover. Pianist Doug Montgomery, 6:30 p.m., call for cover. WEDNESDAY 9/10 In Concert Justin Furstenfeld: An Open Book Tour Jean Cocteau Cinema Rock singer/songwriter, 7 p.m., $25, jeancocteaucinema.com. Meem Community Room, Fray Angélico Chavez History Library, 120 Washington Ave. Edmund G. Ross: A Profile in Courage, by Richard Ruddy, noon, no charge, 505-476-5200. 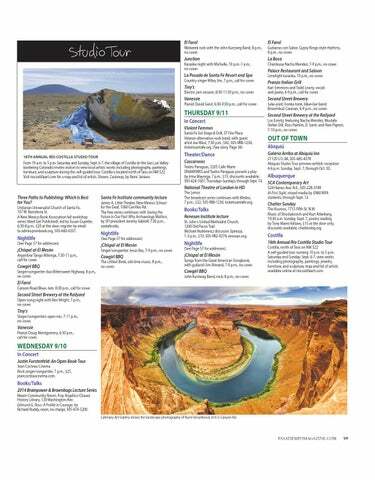 Catenary Art Gallery shows the landscape photography of Rumi Vesselinova, 616 ½ Canyon Rd.